My impression is that of an eleventh century Anglo-Scandinavian, but like so many Anglo-Scandinavians, my persona story does not stop there. My character was from Iceland, and he traveled to various places in Scandinavia, Africa and, of course, America. Cheap pulp fantasy? To some extent, but look at the sagas, which tell of the diaspora of the Norse! They were a widely traveled people, probably more so than many of the peoples whom they traveled among. In the story I tell of my character, he sailed to England soon after the St. Bryce Massacre to help relatives. Fólki is, like all other Icelanders of the time, Christian with heathen overtones, though he converted to Christianity before the Conversion. And that brings me to the subject of this entry in a round-about way. I wear the Wolf Cross. It has a wolf’s head (Fenris I’ve heard, and that is certainly an easy way to describe it; some prefer to call it a dragon), a stylized hammer (unlike the usual Thor’s Hammer of so many amulets) and what seems to me to be an obvious Christian cross carved into its center. Some liken the amulet to the inverted St. Peter’s cross. It dates from the tenth-century and was found in Fossi, Iceland. It is about 3×1.5 cm. I have found only a single example of the cross, but it almost certainly was not unique because it seems to be cast. I picked up my original copy in Iceland over twenty years ago, and the original artifact is in the National Museum in Reykjavik. I found a slightly larger version in a Goth shop a few years later (but lost it). Losing that later copy means that I am always looking for another copy in the right size. I like to refer to it to the MoPs as the “hedge your bets” cross, worn by a Christian of the time who might occasionally pray to Thor. People understand immediately, including a Lutheran minister who I talked to! There are doubts about this, of course. It might be a Christo-heathen cross. It might be a heathen version of the cross. It might be something else. My interpretation, though, is as valid as any of them and shared by a sizable number of experts! There are many copies commercially available, but most of them are larger than the original. That is not unusual. At Pennsic fair this year, a person dressed as a “Viking” bragged that he wanted the biggest baddest Thor’s Hammer he could find to show what a big, bad Viking he was. It goes along with the width of belts and so much else. Modern people tend to think like modern people and don’t want the smaller period thing because it does not go with their idea of the size of artifacts of the era! In the case of this cross, most reproductions are about three times the size of the original. This year at Pennsic, I found the large versions as well, and of course vendors who told me it was an exact duplicate (always know more than the vendors when shopping for accurate goods, it seems). But then in a nearby shop, next to an oversized Fenris Cross, I found a new version. The proper size, although the proportions were different than in the original. I had to make a decision, and it was easy. I prefer jewelry and other pieces of kit that are of the proper size, and the design of the amulet itself is not jarringly dissimilar, particularly when you take into account that modern mass manufacturing was an alien concept. Not finding a copy of that version cross, of course, is a drawback, and I will normally be wearing the replica of the original. The search goes on! 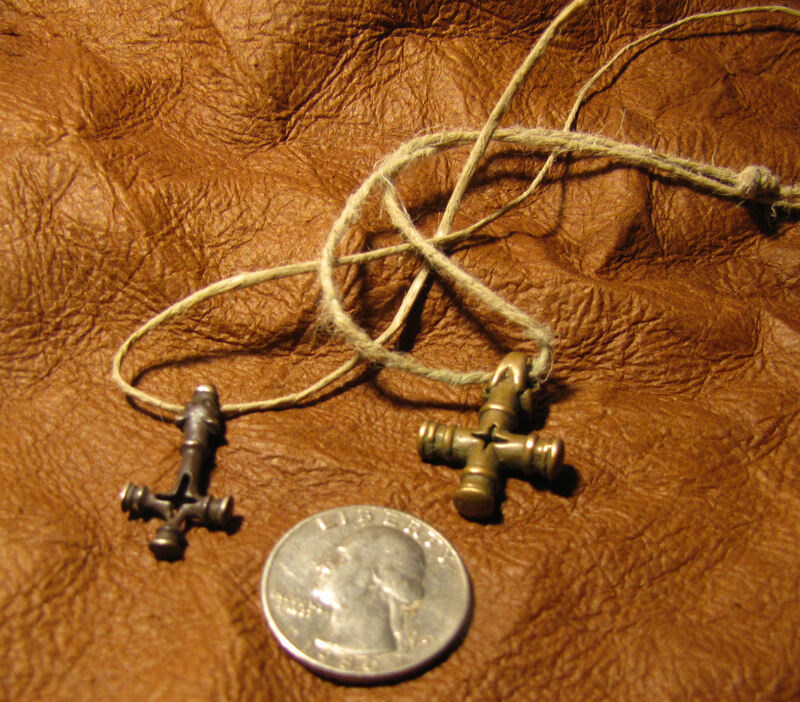 For a picture of the original, along with notes about it and other amulets, see http://www.seiyaku.com/customs/crosses/thor.html and a manufacturer has some notes on the manufacture of its replica larger than the original (but certainly not as larger as some) at http://www.othalacraft.com/thors-hammer-also-called-wolf-cross.-p103.html. This entry was posted on September 20, 2011 by folo1. It was filed under Uncategorized . Some info on the correct size of the piece from the Reykjavik Museum. See where it says “Stærð” is says It is 5x3cm.